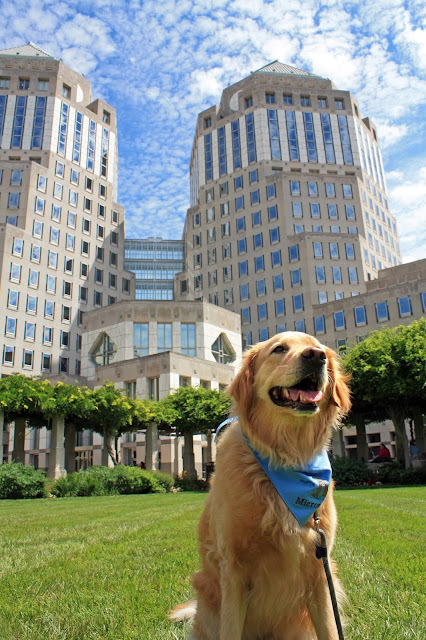 Micron poses at the P&G headquarters to put in his bid as a company mascot. Mr. Clean ain't got nothing on me, says Micron, tossing back his golden locks. The mighty Micron was an honored guest at the Procter & Gamble headquarters in downtown Cincinnati last Friday. He used his therapy dog wiles on the kids of my fellow P&Gers to teach them about the magical stuff of pet therapy visits. And by teach them, what I mean is he got into his usual Zen position (I am One with the carpet, says Micron) and sent out some sort of therapy dog mind rays so kids and adults alike had no choice but to rub his awaiting belly. One simply cannot resist the Call of the Micron Belly. I've seen this phenomena too many times to discount it, you know. It's like seeing a double rainbow or something. After touring the headquarters, Micron is now inspired to be a company mascot. Pick a brand, I tell him. 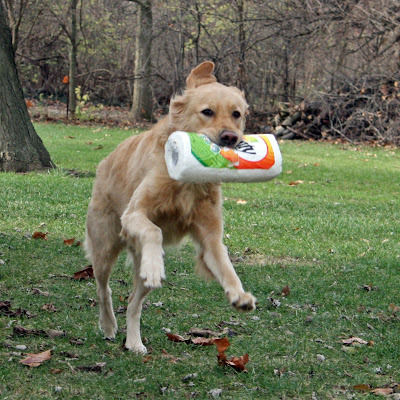 Eukanuba already has Pawl Griffin as their VP of Canine Communications, so you should be thinking about another product. We rule out Mr. Clean, because it's obviously not fair competition for the old guy. And in spite of those pearly white chiclets, Crest toothpaste is out too. I'm leaning towards the Swiffer family of products, because dog knows I sure go through boxes of 'em at my place. The dog disagrees. Ah, he's right of course. Micron reminds me that he has a special, perhaps even symbiotic, relationship with Bounty. We know that, right? If you didn't have the two minute pleasure of seeing the mighty Micron in action on our previous Mutiny of the Bounty post, we have the video at the bottom for ya for an easy click. can't figure out how it got there. No really, just look at it. Hey Bounty, if you want to blow that lame faux lumberjack competitor out of the water, so to speak, we've got the perfect product spokesdog for you. Especially since that other brand had their mascot shave his beard to appeal to some neatnik demographic, I've completely lost interest in him. Our fella here is much better looking . . . and has a passion for the brand. We did get a bit of luck with the lovely sky that afternoon. So much better than the gray cloud cover that seems to cast its gloom over our area much of the time. Happy WW to you, our sweet friend. Yep, puppies and paper towels ... a natural relationship, that. There's that one brand of TP that has a lab puppy on their package which seems well, unnatural. It's not like I'd use TP to clean up a puppy mess. And if it's their intention to suggest their product is a soft as a puppy, that just seems like a rather unpalatable analogy to me. I know I'd buy paper towels with Micron's goofy smile on the package. Maybe the biggest concern is keeping up with consumer demand, do you think? That ear truly does seem out of position! LOL! I know, right? I still can't get a visual on how that happened. I think Micron would be an awesome spokesperson and they'd be silly to pass him up - especially with that magic ear of his. Everything about this dog is one degree off the Normal scale. Including body parts. Micron would be a memorable mascot. Now to come up with a cute jingle to go with his image. As someone who shares a house with a Golden Retriever, my mommy also thinks that Swiffer is the perfect product for you to endorse, Micron. Trying to figure out how to get my ear into that position! I really am pretty lax with my housekeeping skills. I used to worry about keeping up with the dust and dog hair, but then found a new level of happiness by simply lowering my standards. I do love the Swiffer products, though. On the days when we're due to entertain guests, or when The Husband is making comments like the mess in the house is "something a match could fix", then it's time to Swiffer the place. I don't recommend the ear thing for you, my friend. Micron is a professional in the goofy placement of body parts and I wouldn't want you to pull a muscle trying to imitate him. At least do some stretching exercises first, if you do try. Your comment bringing attention to the alleged ear has me a little scared...the longer I look the more worried I become, and the more worried I become the harder I look! Micron is not aloud do grow shark fin ears off the top of his head! He might scare the children!